You call that a disguise? Do we really need another interpretation of Robin Hood? The character has been around since the 1300s in one form or another, his origins, character and ancestry all having been embellished, altered and forgotten over the years. For my money the definitive interpretation, and one that cannot be beaten, is the 80’s TV show Robin of Sherwood which got everything right and has coloured every version, including Prince of Thieves, Ridley Scott’s abomination and even tonight’s feature, ever since! Otto Bathurst, ostensibly a TV director, should be lauded for tying something slightly different; even the opening narration tells you to, “Ignore what you have heard or seen before” in the guise of reinventing the character; thus Robin is young Lord of Loxley and in love (with Marion, of course), drafted to the Crusades, returns to find his lands and castle decimated, teams up with a Moorish commander to take down the evil Sherriff of Nottingham, who is in collusion with the Church to take over the country. 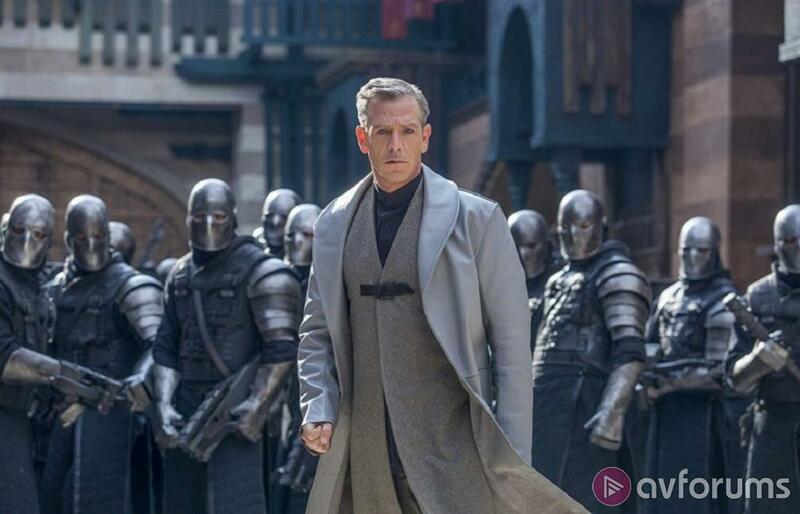 Gone are the Merry Men (indeed Will Scarlet is now an antagonist), gone is the outlaw romanticism (he is just a thief in a hood), Sherwood Forest is mentioned once but not really seen and the stakes are now huge. So. A couple of things. Loxley should be spelt Locksley. And it is very difficult to ‘forget what you know’ when a character has been around, in one form or another, for over 700 years. Elements of this particular genesis have been taken from the 80’s (John the Moorish commander was invented for the show), while others are completely ignored (best exemplified by the noticeable exclusion of all of the Merry Men) – this flies in the face of what everyone might expect and no amount of action or Nazi symbolism is going to cover for that. 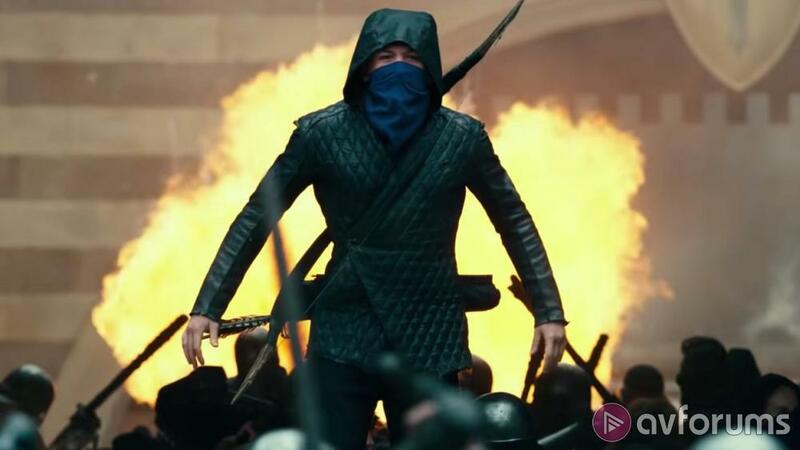 Simply put, adding a new spin on something is one thing, subverting expectation to such a degree that it puts an audience off is another – King Arthur: Legend of the Sword tried and failed back in 2017 while the less said about The Last Jedi the better. It’s not as if the film is any good, either. 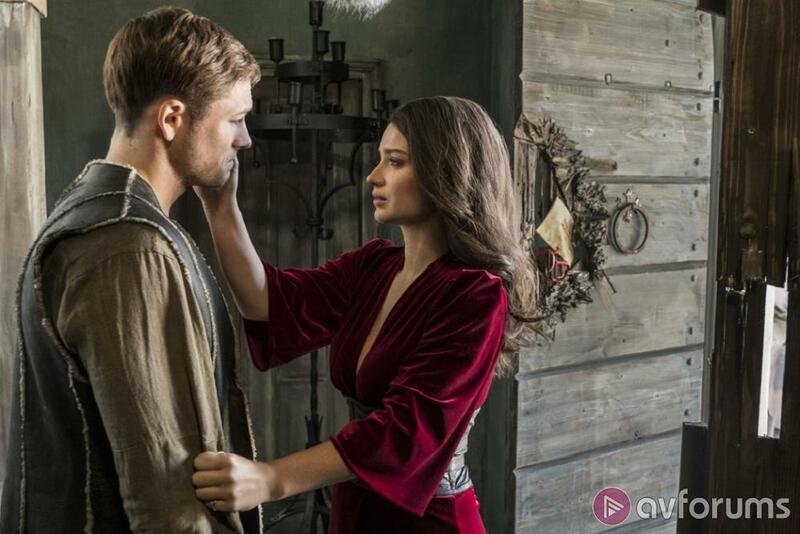 None of the cast have any depth of characterisation, there is no chemistry between Robin and Marion, it’s all pantomime villainy and has a ridiculous plot. The pacing is so high that despite its 2 hour run time nothing much really happens, it’s all crash, bang, wallop and on to the next action scene. It is anachronistic, has no historic or logical grounding (even Nottingham is simply wrong) and, basically, it’s all rather dumb. If you approach the film in such a way then you might get some enjoyment out of it. In much the same way as Legend of the Sword should have, had the makers not used the titular character and just made it a ‘bow and arrow actioner,’ then it might have been more entertaining as it’s not fighting against 700 years of legend. It’s not a hateful film, it’s just ‘meh’. Robin Hood was shot digitally using Panavision Millennium DX cameras with a resolution of 8K and was finished as a 4K DI which has used for this Ultra HD Blu-ray release. The disc presents a native 3840 x 2160p resolution image in the widescreen 2.39:1 aspect ratio, and uses 10-bit video depth, a Wide Colour Gamut (WCG), High Dynamic Range compatible with both HDR10+ and Dolby Vision, and is encoded using the HEVC (H.265) codec. 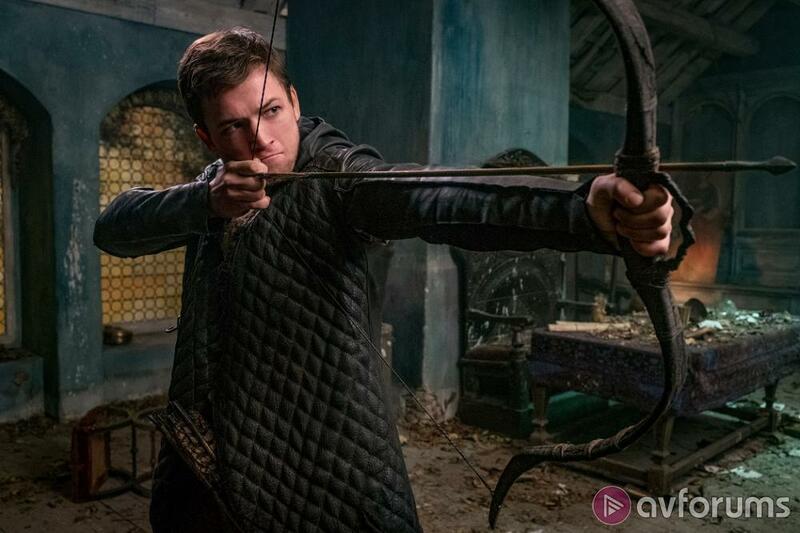 We reviewed the Region free UK Ultra HD Blu-ray release of Robin Hood on a Panasonic 65DX902B Ultra HD 4K TV with a Panasonic DMP-UB400 Ultra HD Blu-ray player. Oh my, what an amazing looking picture this is. Detail is off the charts; everything is crisp, clear and well edged: from skin texture, to clothing weaves, from wood grain to stone surfaces, from coin stamps to cityscape overviews, there is no hint of softness, edges are keen and without loss. Check out any of the establishing shots over ‘Nottingham’; absolutely picturesque - the scorched sand in the desert, the leaves in the forest, the mud in the mines: simply stunning. Add to this the benefits of HDR and the WCG and you have colours that simply pop: check out the reds and blues as Robin enters the church for the first time; indeed check out the stained glass of the same, almost breath-taking. See the depth of orange to the fires, how natural skin tones are, the lush greenery of the forest or the rich colouring of the Cardinals' robes – everything has a natural glow. The black level is rich and deep, hiding shadows when needed and giving depth and punch to the frame, while the whites push out and never clip. The source is pristine, digitally there are no issues, this is about as good as it gets, folks. And pretty much the same can be said for the Dolby Atmos track, which is a no holds barred exercise in excess. The many action sequences benefit from all the channels with pin point arrows shooting around the room, while punches, kicks and explosions hit you in the gut. The overhead channels are used to good effect: check out the running battle in the mines, or the opening desert skirmish. Dialogue is clean and clear, sounds natural and given all the directionality it needs. Bass is deep and strong, filling out effects and ambience with relish and adding significant impact to the low end. The score, which is slightly generic, but on point, makes full use of the surround environment. Indeed, the track doesn’t put a foot wrong and there is a real sense of cohesion and environment. Oh, it’s really loud too! Outlaws and Auteurs: Reshaping Robin Hood – An hour’s worth of ‘making of’ documentary that plays like an entertainment feature; usual interviews with cast and crew, back-slapping and film clips, though some of the behind the scenes footage can be entertaining. Outtakes – 5 minutes of goofs, gaffs and larking about. Deleted Scenes – 8 minutes of excised material. Otto Bathurst directs this new vision of a character that has existed in one form or another for over 700 years. However, instead of what you know, just about everything has been jettisoned in favour of a lean origin, that takes its ideas from a character invented as late as 1980, and raises the stakes of the adventure to include a mental plot to take over the country. Put simply, the film is no good; no characterisation, daft plot, heavy on action and light on brain – and approached as such there might be some entertainment value, although exclusion of the titular character in favour of a generic ‘bow and arrow’ actioner would probably have had more value. As a 4K Blu-ray set, the package from Lionsgate is a winner – the native 4K picture is absolutely stunning in terms of detail, colouring and black level; it doesn’t get better than this. The same can be said for the Dolby Atmos surround track which is heavy, bombastic, pin point accurate for its effects and wonderful in its immersion environment. The extras package is a tad light, though. Write your Robin Hood UHD Blu-ray review.